Old Distribution/ Panel Boards are no longer fit for purpose in Commercial premises. If the building you occupy pre-dates the 1960’s, your electrical installations are likely out of date and potentially unsafe. As an owner, you are responsible for protecting your staff from electrical shocks and fire hazards. 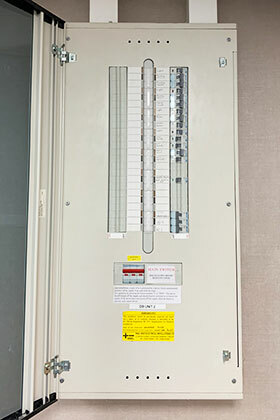 What is a Distribution/ Panel Board? A Panel Board is a component of an electrical system which houses an assembly of switches, fuses and/or circuit breakers in an enclosure. Panel boards are also known as a consumer unit, distribution board, breaker panel, electric panel or fuse board. An upgrade of your distribution board will more than likely require the installation of a residual current device (RCD). An RCD protects electrical circuits, preventing direct contact electrical shocks. There have been significant advancements in distribution/ panel boards since the 1960’s. The design of old distribution boards is no longer sufficient to deal with the number of electrical devices that we use. If you have more than one fuse box, a mixture of different boards, visible cast iron switches or a wooden back…You need to upgrade your panel board. The Electricity At Work Regulations 1989 places the legal responsibility on the owner of an electrical installation to prevent electrical accidents. These regulations are to ensure all electrical systems and apparatus receive regular maintenance. Legally an owner must protect users from electrical shocks or fire hazards and ensure their safety. Often when Companies expand, it’s sometimes easier to just keep on adding to their existing installations. Consequently, this creates an overload situation, which can cause electrical failure and major downtime in the future.